Set of 2 swing away side lateral back supports with brackets and hardware for The Ocean, The Ocean SP, The Ocean XL, The Ocean VIP, The Ocean VIP Recline, The Ocean E-VIP. These are suggested to be used with Arm Width Extension on the Ocean VIP. ***Special Order, please call for lead time. Trunk support pads on swing away bracket. Side laterals mount on the back frame for additional upper body support. Pads swing away for transfers. Lift and drop arm into bracket to hold position. 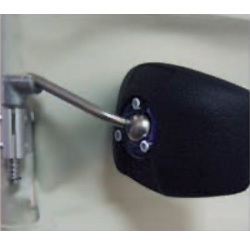 Ball joint on back of pad allow you to position pad angle for best placement, while metal insert can be hand shaped to conform to an individual. Brackets fit 1" OD tubes.